Battery Cycle Life Laptop Battery Comparison. Laptop Battery Cycle Life Comparison – See How Max Capacity holds Over Time? Li-Ion Battery Cycle Life is a test performed by most Li-Ion cell manufacturers and can be used to describe the expected performance loss over the battery’s service life. One Cycle is defined to be when a battery pack is completely discharged from a fully charged state and then recharged back to its remaining full capacity. Each time a battery pack is charged and discharged it loses its ability to store as much energy as it did from the prior charge. The typical lifespan of an average Li-ion battery is about 300 charging cycles. Really cheap battery packs are even less. Typically, poor performance is very noticeable after about 300 charges. By 400 charges most laptop batteries will require replacement. That said, our Max Capacity replacement laptop batteries are designed to exceed 500 cycles. We provide metrics about our laptop batteries so consumers can understand what they are buying. Also, with numbers like these we are proud to show off! 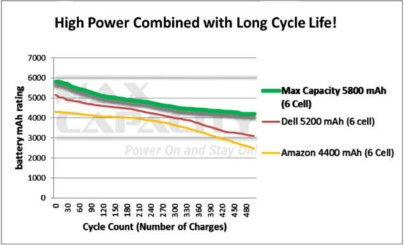 The following graph shows how our Max Capacity laptop batteries maintain their capacity over 500 charging cycles. When compared against other popular replacement packs our laptop batteries really do shine! Note: The graph above illustrates 80% of original capacity after 300 cycles at an operating temperature between 77° F and 104° F (25° C and 40° C). Higher operating temperatures can result in a 70% or more loss of capacity given the same number of cycles.